Goodreads says, "It began at an ancient Scottish stone circle. There, a doorway, open to a select few, leads into the past—or the grave. Dr. Claire Randall survived the extraordinary passage, not once but twice. Her first trip swept her into the arms of Jamie Fraser, an eighteenth-century Scot whose love for her became a legend—a tale of tragic passion that ended with her return to the present to bear his child. Her second journey, two decades later, brought them together again in the American colonies. But Claire had left someone behind in the twentieth century—their daughter, Brianna.... Now Brianna has made a disturbing discovery that sends her to the circle of stones and a terrifying leap into the unknown. In search of her mother and the father she has never met, she is risking her own future to try to change history ... and to save their lives. But as Brianna plunges into an uncharted wilderness, a heartbreaking encounter may strand her forever in the past ... or root her in the place she should be, where her heart and soul belong...."
Jamie, Claire, and Ian are in the United States; first stop: Charleston. The year is 1767 and the world is very different than Claire is accustomed to. There's the impending war and the issues surrounding slavery, which keeps everyone on their toes. The wilderness of the Carolinas also proves to be dangerous with the wildlife, rugged landscape as well as Native Americans. 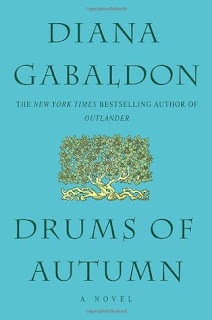 In Diana Gabaldon's Drums of Autumn, there is also a secondary plot that focuses on Claire and Jamie's daughter, Brianna. She is still in the 20th century, but doesn't want to stay for long. She has plans on reuniting with her mother as well as meeting her father for the first time. To complicate matters further, there's also Roger Wakefield, who proves not only to be a reliable friend, but also possibly more than a friend. 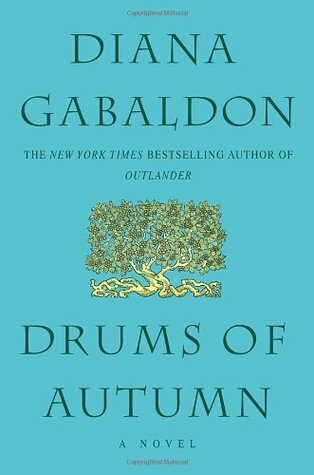 Although I didn't enjoy Drums of Autumn as much as the other books in the series, I still found it extremely entertaining overall and will definitely continue with the series. I'm pretty sure I have said this in all of my reviews for the Outlander series, but I adore the relationship between Jamie and Claire. I especially enjoyed it in Drums of Autumn, because they are more established and there's no major drama surrounding the fact that they are together. They are away from it all, in America, and sort of starting fresh. Of course, things are never easy for these two though. There's many obstacles that they must overcome, but at least they have each other. Meanwhile, Claire really misses her daughter and Brianna feels the same way in Drums of Autumn. Although Brianna is starting a possible relationship with Roger, a Scottish student who knows all about her past, she still longs to see her mother again and meet her father. Who can blame her? She knows all about the stones and their time travel abilities due to her mother, but can she really leave it all behind? What will happen when she ends up in Scotland? Let's just say there are many adventures in store for Brianna. I have a definite love/hate relationship with Gabaldon's writing style. On one hand, I truly relish in it, but on the other hand, sometimes it can be too long winded with a lot of detail. It took me quite awhile to get through this lengthy tome and although I knew it would be worth it in the end, there were times I felt it dragged on a bit. Mostly this was the case with Brianna and Roger's subplot. Although I enjoyed their story, I am not as invested in them as I am with Claire and Jamie, so it was a struggle at times. Overall, I am excited to check out the next book in the series and see where Gabaldon takes us next. Plus, it's always nice to get my Claire and Jamie fix since the TV show won't be back on again until the spring. If you enjoy historical fiction, romance, time travel, and adventure, you really should check out the Outlander series. I agree completely Christina, the long-winded writing style was what I struggled with the most on the first book (the only one I've read). It just took so long for Claire to get to Jamie, and I'd heard so much about them I was impatient to finally see them together! Glad the relationship drama between them is at a minimum in this installment, they so deserve to be happy! I know, right?! I love this series, but I wish the books were a bit shorter. Thanks for visiting, Jenny! I so wish I could get through these books with your patience, Christina. Perhaps an audio book would work better? I am not sure how long that would be as an audio book, but definitely something to think about. It's such a good series, but SO lengthy. Thanks for visiting, Joy! I've only read this one once years ago. I've been meaning to reread the first four books and then catch up on the rest of the books. The pacing can be slow at times. Unlike A Game of Thrones I usually notice how long these stories are. Yeah, I felt like the pacing in this book, especially, was a little off compared to her other novels. I haven't read Game of Thrones, but my husband loves the series and doesn't seem to mind the length at all! Thanks for visiting, Christina!